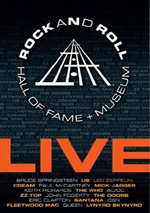 All seven episodes from the second season - featuring appearances by Bono and the Edge, Sheryl Crow, Ron Sexsmith, Neko Case, Nick Lowe, John Prine, Bruce Springsteen, and more--are included in this two-disc set. When rock musicians show up on TV, it tends to be for brief talk show segments. They get to play a song or two, and if they’re famous enough, they might chat with the host for five minutes or so. Not exactly a whole lot of room for depth and insight, is there? The grand world of cable TV opens up possibilities, and a Sundance Channel series called Spectacle delivers a decidedly unusual focus. 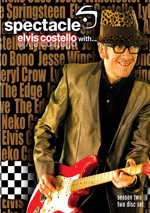 Rather than have general chat show hosts or rock critics delve into the music, Spectacle features rock legend Elvis Costello as host and leader of the house band. This means that we truly get to hear musicians discuss music, as Costello interviews the participants. Each show also features performances, many of which include Elvis as an aspect of the band. Here we’ll look at the seven episodes from the series’ second season. The program synopses come from the Blu-ray’s packaging. Bono and the Edge (aired 12/9/09): “The opening episode finds host Elvis Costello conducting an intimate and revealing conversation with fellow Rock and Roll Hall of Fame inductees Bono and the Edge of U2. 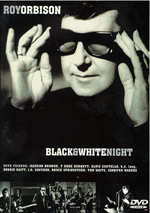 Recorded at the Masonic Temple in Toronto, Canada, in the midst of the band’s 360 World Tour, Bono and the Edge pull the curtain back on the writing and recording process behind some of their most famous songs, their unlikely friendship with Frank Sinatra and perform rarities as well as a show-ending mash-up with Elvis and the Imposters”. The show includes performances of “Mysterious Ways” (Elvis and the Imposters”, “Stuck In a Moment You Can’t Get Out Of”, “Pump It Up” and “Get On Your Boots” (Elvis, Imposters, Bono, Edge), “Stay (Faraway, So Close! )” (Bono, Edge, Steve Nieve) and “Two Shots of Happy, One Shot of Sad” (Bono, Imposters). U2 are a top-five act for me, so it’s a delight to see Bono and Edge sit with personal top 10 Elvis. Both have a moderately shared past; they crossed paths more than a few times over the years, though it’s funny because Elvis always seemed like an “elder statesman” with his whopping three-year head start in the recording studio. Elvis digs into a mix of aspects of U2’s career well and asks a nice array of questions as we get good semi-obscure stories from U2’s 30-year career. Some of the material’s suspect – Bono claims the band formed in 1979, and states that he met his wife the same month the group came together even though they started to date the prior year – but both Bono and Edge are charming and interesting. Musically, the show’s more hit or miss. The promised rarities really just means “Two Shots”; none of the others can be called rare U2 tracks. Elvis’ voice doesn’t fit U2 songs well, unfortunately; he just bludgeons his way through the tunes and doesn’t mesh with Bono. The “Pump It Up”/”Boots” mash is fun, though, and the other songs without Elvis work well. Sheryl Crow, Neko Case, Ron Sexsmith and Jesse Winchester (aired 12/16/09): “Elvis is joined by guests Neko Case, Sheryl Crow, Ron Sexsmith and Jesse Winchester for an old-fashioned guitar pull; a swapping of songs and stories amongst this amazing group of singer/songwriters.” Performances cover “Payday” (Costello, Crowe, Case, Sexsmith, Winchester, Nieve), “If It Makes You Happy” (Costello, Crowe, Case, Sexsmith, Winchester), “Don’t Forget Me” (Case, Nieve), “Sham-A-Ling-Dong-Ding” (Winchester), “Brand New Tennessee Waltz” (Crow, Winchester), “Everyday I Write the Book” (Costello, Sexsmith), “Leaving Las Vegas” (Costello, Crow, Case, Sexsmith, Nieve), “Prison Girls” (Costello, Crow, Case, Nieve), and “Ring Them Bells” (Costello, Crow, Sexsmith, Nieve). While I definitely don’t like any of the involved guests 1/100th as much as I love U2, this still becomes a pretty satisfying program. It actually feels a bit more coherent than the prior show, largely because the artists fit together better. As I mentioned, Costello and U2 didn’t connect well, whereas this episode’s acoustic tone goes nicely. Elvis tones down his vocals and avoids the shouting that went so poorly with U2’s songs, and all of the performers come together in a nice manner. Don’t expect a lot of chitchat, though, as the interview side of this episode is much less substantial. Perhaps that’s a reflection of the larger cast; since the number of participants means that Elvis can’t get into their careers in depth, the decision may’ve been made to largely skip that side of things. That’s a bit of a disappointment, as I like the “musicians talking music” side of things, but musically, this one succeeds. Levon Helm, Nick Lowe, Richard Thompson and Allen Toussaint (aired 12/23/09): “Elvis literally builds a band in front of the audience’s eyes and ears. Joining him for this once in a lifetime jam session are his former record producer Nick Lowe on bass, legendary New Orleans producer/pianist Allen Toussaint, UK guitar giant Richard Thompson and drummer Levon Helm from the Band.” We get renditions of “Rag Mama Rag” (Elvis and Imposters), “Shoot Out the Lights” (Costello, Imposters, Thompson), “The Beast in Me” (Lowe), “Holy Cow” (Toussaint), “Tennessee Jed” and “A Certain Girl” (Costello, Imposters, Helm, Toussaint, Lowe), and “The Weight” (Costello, Imposters, Lowe, Helm, Thompson, Toussaint and Ray LaMontagne). This one offers a decent balance of talk and music. It’s not as informative as the Bono/Edge episode, but it gives us more material than the one with Crow and company. It’s also more fun musically. While I thought the last show was coherent and likable in that regard, I’m not super-wild about the acoustic setting, whereas this one goes for a more rock-oriented feel. In a broad way, at least; songs like “Holy Cow” don’t exactly rock. But the tunes use the full band and are peppier than those from the semi-mopey singer-songwriter show. The performances here sound quite good, and the episode might even sell some albums; Thompson’s performance is pushing toward picking up some of his work. By the way, when Costello partnered with Toussaint for an album and tour in 2006, I didn’t look forward to it. I thought this would be an indulgence but it turned out to be a terrific partnership. The River in Reverse was Costello’s most interesting album in a while, and the show was quite satisfying. It’s nice to see Toussaint again here, as he’s a gentleman and a talent. Elvis Costello with Mary-Louise Parker (aired 1/6/10): “Elvis slides over to the guest chair as actress/music journalist Mary-Louise Parker guest hosts. Elvis performs songs from throughout his career and discusses songwriting and collaborating with the likes of Paul McCartney, Burt Bacharach and T Bone Burnett.” We find takes on “(I Don’t Want to Go to) Chelsea”, “Motel Matches”, “Shabby Doll” and “So Like Candy” (Costello and Imposters), “I Still Have That Other Girl” (Costello, Nieve), “I Threw It All Away”, “Town Cryer” and “Brilliant Mistake” (Costello). On the surface, this sounds like a great episode, but in reality, it’s a bit of a disappointment. Much of the problem comes from Parker’s inability to act like anything other than a star-struck superfan. Costello mentions her rock critic bona fides at the start, but you’ll not get a lot of that sense from the discussion; Parker tends to stick with “that was awesome!” style remarks and her questions don’t tend to lead the conversation down a particularly revealing path. At least the show’s stronger musically, mostly because Elvis pulls out some definite rarities here. 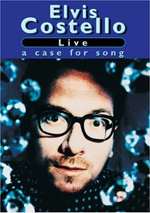 Of all the performed songs, “Chelsea” is the only one that makes Costello’s live sets with regularity. It’s a bit of a disappointment that he does short renditions of some tracks, but it’s still cool to hear them. That side of things helps redeem the episode. Lyle Lovett, Ray Montagne and John Prine (aired 1/13/10): “Elvis explores the role of the singer/songwriter with three of the best: the legendary and highly influential John Prince, four-time Grammy winner Lyle Lovett and the critically acclaimed Ray LaMontagne. Each stands alone in the spotlight to perform and sits for an intimate chat with Elvis on their craft.” This one provides renditions of “I’m Ahead If I Can Quit While I’m Behind” (Costello), “Lake Marie” (Prine), “Natural Forces” (Lovett), “Henry Nearly Killed Me (It’s a Shame)” (Costello, LaMontagne, Jay Bellerose) and “Loretta” (Costello, Prine, Lovett, LaMontagne). This is one of the episodes during which the interviews become the strongest element. I think all the musicians have ample talent, but I just can’t say their work does anything for me; I didn’t dislike their songs, but they didn’t stand out as anything I’d want to hear again. The interviews are quite enjoyable, though. Prine, Lovett, and LaMontagne are all interesting and well-spoken, so they discuss their art well. Prine is the biggest charmer of the bunch and he adds the best parts of the program. Bruce Springsteen Parts 1 and 2 (aired 1/13/10 and 1/20/10): “Elvis sits down with Bruce Springsteen in this special two-part episode. With his guitar in hand, The Boss opens up about his pre-Estreet Band bands, his early and current inspirations, and the resurgence of New Jersey. E Street Band members Nils Lofgren and Roy Bittan sit in for a couple of songs.” We hear “She’s the One” (Costello, Springsteen, Lofgren, Imposters), “Wild Billy’s Circus Story” (Springsteen, Lofgren, Bittan), “American Skin (41 Shots)” (Springsteen), “I Can’t Stand Up For Falling Down” (Costello, Springsteen, Imposters), “Radio Silence/Radio Nowhere/Radio Radio”, “Seeds”, and “The Rising” (Costello, Springsteen, Lofgren, Bittan, Imposters), “Oh, Pretty Woman” (Costello, Springsteen), “Black Ladder” (Costello, Springsteen, Lofgren), and “Galveston Bay” (Springsteen, Bittan). Earlier I noted that U2 are top five for me; Bruce is top three, maybe even top two. I’m at 103 concerts to date, so obviously I’m more than a little interested in the man’s work. Logically, these two episodes become the package’s most intriguing for me. While I can’t say the programs live up to my high expectations, it’s still a good one. Bruce and Elvis show a good connection as they chat about music and life; this is probably the best chemistry between Costello and subjects since we saw him with Bono and Edge. The music works better here, though, as Costello fits Bruce’s style more appropriately than it does U2’s. As a longtime Springsteen fan, it’s a treat to hear him expound on his life and music for so much time, and the musical segments are a lot of fun. Spectacle appears in an aspect ratio of approximately 1.78:1 on this Blu-Ray Disc. The shows boasted terrific picture quality. Sharpness always looked great. The episodes demonstrated nice clarity at all times, with nary a smidgen of softness on display. I noticed no jaggies or shimmering, and edge haloes remained absent. Shot HD, no source flaws became a factor, either. Colors looked sumptuous. The shows stayed with primary colors, mostly via lighting, and the hues seemed rich and full. Blacks were deep and tight, and shadows – evident in moody stage lighting as well – looked clear and discernible. The episodes really looked nice. Much of the series’ DTS-HD MA 5.1 audio was good, but I felt the tracks lacked substantial bass. No, I didn’t expect heavy low-end, but the mix didn’t present much depth, so the music tended to emphasis treble too much. This wasn’t a truly thin track, but it didn’t display as much warmth as I’d like. The rest of the mix seemed positive, too. During interviews, speech was always concise and natural, and song vocals appeared similarly distinctive. Everything but bass worked fine during the tunes; those elements displayed nice snap and clarity. As for the soundfield, it demonstrated reasonably crisp stereo presence. Vocals stayed centered and instruments spread across the front in a satisfying manner. The surrounds concentrated on audience noise, so don’t expect much more from them than applause. This wasn’t a bad mix, but I wish it would’ve boasted low-end. Note that the discs also provide a PCM stereo track. This lacked the surround activity of the DTS mix, of course, but it seemed warmer and showed greater punch. I regard it as the preferred version. A few extras fill out the set. A Behind the Scenes Documentary goes for 42 minutes, 11 seconds. Hosted by executive producer/series creator David Furnish, we get notes from Elvis Costello, executive producers Martin Katz, Jordan Jacobs, Steve Warden and Elton John, actor/music writer Mary-Louise Parker, writer Malcolm Gladwell, Rolling Stone senior editor Michael Endelman, set designer Anne Brahic, production manager Milo Lewis, director Dave Russell, co-executive producer Alex Coletti, and musicians Sheryl Crow, Ron Sexsmith, Jesse Winchester, Bono, the Edge and Neko Case. We learn a bit about the origins and development of the series as well as specifics about shooting the episodes. The documentary includes a little fluff, but it’s usually a pretty solid look at the series’ production. We get a lot of good behind the scenes glimpses and learn quite a bit in this consistently intriguing piece. We also get three Bonus Songs. We find U2’s “Dirty Day” (Costello, Imposters), Costello’s “Alison” (Bono, Edge) and Costello’s “I Want You” (Costello, Imposters). Elvis sounds better on “Dirty Day” than the U2 songs that made the final episode, so it’s too bad the performance didn’t show up there. “Alison” is more of a misfire, mostly because Bono doesn’t fit the song well – at least not in the featured pitch. He seems tentative and wispy the whole song; I get the feeling he wants badly to find the right approach but just doesn’t get there. I can totally understand why “Alison” stayed on the cutting room floor. Finally, “I Want You” brings us a semi-obscure nugget from 1986. It’s never been a fave – Blood and Chocolate always kind of left me cold, as I prefer the same year’s King of America - but it sounds pretty good here, with some dissonant but effective guitarwork the highlight. Spectacle is such a terrific little series I can’t help but wonder why someone didn’t develop it sooner. It’s a consistent delight to hear a musician as legendary as Elvis Costello discuss the craft with other even-more-notables like Bono, Edge and Bruce Springsteen. The Blu-ray delivers excellent visuals, decent audio and a few useful supplements. Music fans need to own this set.